As we walk onto the crab deck, I can’t suppress a smile when I see a pair of red and yellow plastic palm trees. With the rolling Chesapeake farmlands as a backdrop, they look like two happy misfits determined to inject a little tropical spirit into the landscape. We’ve seen this phenomenon plenty of times before – the whimsical influx of Polynesian décor amidst steamed crabs and nautical gear. Scowling tiki masks get nailed on walls beside portraits of 19th Century ship captains. Pictures of hula gals in grass skirts dance next to signs for Natty Boh beer. A local crab deck owner once told us about his annual trek to Florida to buy palm trees. He ties the 12-foot tropical beauties in the back of his Ford pick-up and plans a white-knuckled route home trying to avoid low bridges. The entire trip back, he prays they don’t come loose and topple onto the highway. The harsh Chesapeake winters kill his trees, so he has to return south every spring to transport more swaying palms. So I start to wonder what’s behind this tiki-craze? When did folks start going to such lengths to blend Polynesia into traditional décor? Well, it all began back in 1934. Smack dab in the middle of the Great Depression, a traveler named Don Beach, opened a Polynesian restaurant in Hollywood, CA. Flaming tiki torches, bamboo furniture, and carved masks from his island journeys caught people’s attention, and they raved about his fruity rum drinks. It was such a hit that 12 more locations were spawned. Before long, other restaurateurs like Trader Vic caught tiki fever and spread the island groove across the country. This set the stage for American soldiers returning home from the Pacific in World War II with souvenirs and vivid stories of exotic lands. Housewives held luaus instead of backyard barbeques and dressed their men in tropical-print shirts instead of white button-downs. Tiki’s boom-time hit when Hollywood got on board. Movies like Jaguar God and South Pacific gave the masses a glimpse of island life, and girls went wild over Elvis during his Blue Hawaii Period. 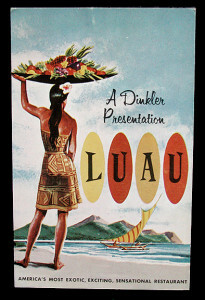 By the time Gilligan’s Island appeared on TV, tiki-mania had shifted into high gear. By the late 1960s, however, Polynesian Pop started to decline. American youth turned their focus to the jungles of Vietnam, protesting the war and rejecting the frivolity of their parents’ generation. Soon, disco balls replaced tiki masks in lounges, and American Tiki went into hibernation. But not for long. By the 1980s, the new generation went retro and dug through attics and yard sales to find vintage hula dolls, tiki mugs, and Hawaiian shirts. Tiki was back in vogue, from Oregon to New York, and the rage trickled down into the Chesapeake. To accommodate the revived quest for tropical fun, Bay restaurants strung colorful lights around wooden decks, turned up the volume of Buffett and Marley tunes, and taught bartenders how to make Mai-Tais, Zombies, and other tiki classics. Palm trees started popping up along the water from Virginia Beach to Baltimore and beyond, and tiki found its place among the oyster boats and crab shacks. I raise my cool Orange Crush in agreement and make a toast of thanks to the benevolent Gods of Tiki. grew up in Oil City, a small town in western Pennsylvania. She worked in restaurants in Pittsburgh, New York and Washington, D.C. Picking crabs doesn't come easy to her, and she leans more toward tiki. But after visiting every Maryland county along the Bay for almost two decades, she can whip up a mean batch of fried oysters and bake a respectable Smith Island Cake. Her recipes for crab pierogies and rum punch are absolutely legendary.